After shooting with digital cameras, cell phones, and the like for several years now, you no doubt will have a massive collection of important and valuable data you will want to take care of for many years to come. One of the main questions I hear is "what hard drive should I use to back up my digital photos and videos?" and I intend to help you out with exactly that decision and why I've approached my data backup the way I have. Read on if you're shopping for hard drives. Before we really get into it, everyone likes to save a buck or two here and there, but don't just go for the cheapest hard drive you can find. If your digital media content is the product of hours of work, thought and previous experience, do you really want to trust it to a cheap-o hard drive? If the sale of a single photo on that hard drive has earned hundreds of dollars - does it seem appropriate to use a $60 hard drive to store it on? I don't think so. There is a lot to consider in shopping for hard drives. How does the hard drive connected to your computer? How fast is it? How likely is the hard drive to fail? And of course, almost most importantly, how much storage space is on that hard drive? There are alternatives as well - and that is storing your valuable data 'in the cloud' which I will also briefly touch on. 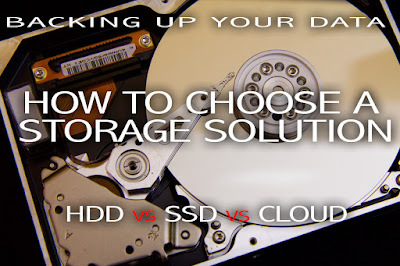 To narrow down your decision, the first question you should ask yourself is "how much hard drive storage space do I need?" - and related to that "how long will it last me?". In this day and age, data storage is more of a constant expenditure than an absolute amount. The storage space you need will always be increasing for as long as you are shooting new images, videos, animating, and writing books, or blogs, or whatever it is you create. For me; in the most recent years, I've been needing about 2TB per year. That will change starting from now on because I've started shooting in 4K which means greater file sizes, and there is also a newborn baby in the family, which means there are a lot of personal photos that I will want to take care of that I wasn't necessarily shooting before. So consider how much space you need - and then if you want to be really safe - double it. Well the great thing about digital data is that it is easily duplicated. If we could make a second copy of every hardcopy book on our shelf, that would be pretty sweet, but we can't. We can do that with our photos and videos though. If something is actually important to you, you really should have at least two copies of it. Storage is cheap, duplication is easy, and you never know what will happen or what will fail. We call this redundancy. If you use about 1TB of data per year in photos and videos, buy two 1TB drives, and make them exactly the same. Keep one easily accessible in your house, and then try to store one 'off-site'. Because you never know what will happen, whether its a natural disaster, your house gets robbed, burns down, or something terrible like that - you don't want your precious data to fall victim to such an event. Leave a duplicated hard drive at a friend's house, a parents house, a well hidden spot at your work, just generally - somewhere else. Mine are in a different city. Cloud backup is similar to off-site backup but I will examine that more closely further down the line. Not all hard drives are created equally. There are two major types. One is SSD's which stands for solid state drives. That means no moving parts. Imagine it like a massive memory card but it is for your computer and not your camera. They are much smaller, generally faster, lighter, but also much more expensive than the traditional spinning hard drives that you may recognize on the inside of your computer. If you've shopped for a lot of memory cards, you'll know that they rate them in MB/s or megabytes for second, which is why you need faster cards to record 4K footage because it's more data per second than something in HD or SD resolutions. So this is how SSD drives are rated. Traditional hard drives work like a vinyl record - the platter spins as an arm reads and writes onto the disk. So their speed is directly related to their RPM rating. Most HDDs come in 5400RPM and the faster 7200RPM nowadays. I'm sure you could find slower ones in the not too distant past, but most of what you'll see these days are one of those two speeds. So the higher RPMs, the faster you will be able to read and write data onto your drive. There are also 2.5" and 3.5" drives, and these refer to the physical size. 2.5" drives are typically found in laptops, and 3.5" drives are typically found in a desktop computer. In computing, when you use smaller components, they generally get more expensive for the same capacity, so 3.5" HDDs are usually the cheaper option. I don't know if this is the exact terminology, but a hard drive enclosure is generally a drive that is used externally, it plugs in through something like your USB or Firewire, or Thunderbolt port, but it more than likely will need to get more power from the AC wall outlet. This is especially true if it is a HDD bay that holds more than one hard drive like a RAID configuration does. If you need extra storage for a computer that lives on your desk, this is a great option. It is still somewhat portable, but not the type of drive you could use while commuting on the train or plane because it still needs wall AC power. Most bays and enclosures will be using 3.5" size drives, which is a contributing factor that is likely to make them cheaper per GB than a full portable or mobile HDD. These are more and more common now. They typically only use a a single USB cable, and sometimes a second cable that also plugs into a second USB port for the sole purpose of pulling more power from your laptop or computer. The thing that sets these apart is you can bring and use them anywhere you can flip open your laptop. They can be great for saving data on road trips, etc. These usually use 2.5" drives which gives them a smaller form factor, but a slighter higher price per GB than something like your external enclosure. This is my newest favourite way to buy drives and backup my data. You can buy internal drives, and plug them into an external dock. A dock is similar to an enclosure, but with an enclosure, you typically have screws, and some level of disassembly in order to remove the drive from the inside of the enclosure assembly. With a dock, it's much simpler than that - usually a single button and the drive 'pops out'. This is a blessing and a curse because you can invest in a single 'dock' (which run around $100) and then buy many 3.5" or 2.5" drives to plug into it. The only thing is, most docks will only take a single drive at a time. There are some serious caveats - such as the circuit board of the drive is usually visible, so keep drinks very far away, and your drive will likely not sustain a fall, or something falling on it. Also because they are so easy to remove, if you were ever mid transfer and the HDD was knocked out of the dock, it could have problematic consequences. But if you have a nice peaceful permanent office space set up, an external HDD dock could be the perfect option for you. There is no sense in getting an ultra fast drive if you are going to be creating a bottle neck to your computer using a slow port. So you may buy a SSD drive, but if you're on an older laptop, and connecting through USB 1.0 or 2.0, you won't be taking full advantage of that drive's speed. The way you connect your drive to your computer does make a difference. Take some time to figure out what the RPM speed or data transfer rate of the drive is, what port it communicates through and then make sure that you choose the best port on your computer to take full advantage of that speed. When you talk about backing up 2 or 3TB of data, that can take a very long time - excruciatingly long if you're dealing with very slow transfer speeds. I do it this way because 3.5" internal drives are cheap for a lot of storage, so for permanent backup they are a great solution. I buy 2, 3 and 4TB drives for my backups which I run once per month and try to keep everything redundant with at least two copies of everything. I keep photo drives separate from video drives, I have one for my wife's computer, and most recently, I started one for photo and video of our newborn that I can one day hand him to watch his own history starting from day one. I mentioned redundancy a few times - actively making a copy of every piece of data that is important to you. And then if you want to keep one copy off-site that is up to you. RAID means Redundant array of inexpensive disks, or in other words - multiple copies of your data spread across multiple hard drives. RAID systems take care of the duplication for you whenever you put something onto a RAID drive. There are multiple levels of RAID which is essentially how many redundancies there are, or how much of your drive can become corrupted before you actually lose access to it's stored data. I don't have a RAID system personally, I am not opposed to them either, it's just they haven't worked themselves into my system and my storage needs don't dictate them yet as I take care of my own level of redundancy. Like I said earlier, not all drives are created equal, and that goes for certain brands over others. I've only once had a hard drive fail on me. It was not a pleasant experience. And it was the first drive I bought that wasn't a LaCie brand. It happened several years ago, so I am over it, but regardless - I was a bit sour about it. It was a Samsung drive that crashed, and took me quite a while to run an effective recovery on it. I took it to some local computer stores who didn't have much luck and eventually did it myself. I didn't get 100% of my data back but a good portion at least. Have that happen one time and it will put 'the fear' into you and you'll do everything in your power to avoid a catastrophic failure ever again. I stuck with LaCie drives for the longest time - typically their 'mobile rugged' versions, but the cost added up significantly over time which prompted me to switch to using internal 3.5" HDDs with an external dock. All I can say, is do your research on hard drives. A lot of companies test failure rates. I've been sticking with the Western Digital "Red" 3.5" 2TB, 3TB and 4TB drives which are built for 'NAS' or to be network-attached storage drives, which means they are designed to be on and accessible all the time, and sometimes by multiple computers at once. Even although mine will only be used by a single computer, and maybe for a few days at a time only, it's good to get something designed for a more rigorous use than you need. For backing up my wife's desktop computer which is also our TV computer, I used a WD "Green" 3.5" 2TB because it will be used to backup her computer less often, and hold less valuable data. Last but not least, we have the 'cloud' option. It can be instead of using physical backups, but most use it in-addition to. I don't use cloud backup solutions, and I'll go over that decision making process, and what I know about how they work. Similar to the way everything software is priced now, it is on the monthly or yearly subscription model. So let's say you want to store 2TB of data for the next ten years - that could end up $3000 worth of subscription rates with a cloud service. Compare that to the 2TB 3.5" HDD I bought for my newborn's photo and video which I intend to hand off to him when he's old enough to take an interest in his own 'history' through photo and video which came with a one time price tag of $110. It's not that a record of his past not worth the $3000 in subscription fees - far more than that in fact - but I can accomplish the same thing far more affordably, leaving more funds which I can dedicate to him in other ways. A lot of the cloud backup services have some level of automation that will backup your data as it is created in the background while you go about your daily life. You can employ this sort of automation with software for your computer and local, physical backups, but it is worth noting that almost all cloud services have something like this to offer. You're sending GB or even TB across your internet service provider, so it's worth noting that if you're used to transferring files across thunderbolt, or USB 3.0 - those transfer speeds are not really going to be available to you in your cloud data solution, unless you're already paying a hefty fee for a gigabit connection with your ISP. So there is the transfer speed - which means you won't be able to work directly off the cloud - if you ever need to access your backup data, you'll have to have that free space on your local computer to pull it down locally and use it like you would anything else. So you may need extra external drives anyways - in which case - see above. haha. In addition to the download speeds - you also may be limited by bandwidth allotments from your ISP, usually in the amount of GB per month. For instance, when I was living in the country on a rural satellite connection, I got 2GB of data per day, and 60GB per month - that means to back up 1TB of data would take me about a year on that internet connection, and I wouldn't have any spare bandwidth to do anything like watch netflix, upload photos to social media, share youtube videos, etc. So that could be a major consideration depending on your current ISP set up. I don't know a whole lot about methods or levels of encryption with the cloud storage solutions, but the fact remains that your most valuable of data is being housed by someone else, you may not even know where - physically. There is no escaping hackers these days, so I can't imagine any concrete guarantees that your cloud backup data will be 100% protected from a hacker. Maybe there is, in any case - that is a factor you should investigate before investing in a storage solution in the cloud. Because I don't want to sound like I am hating on cloud storage solutions, I should outline one of the major benefits. The mobility - you can access your data from anywhere with an internet connection, without physically carrying around anything. This is obviously a huge bonus. Let's say you're on a trip and plan to fill more memory cards worth of space than you're carrying - instead of having a portable HDD to backup your work, you can be sending it safely to the cloud for you to download when you return to home-office. What if you were travelling, and backing up your memory cards to a physical HDD and then your hotel room is robbed, or baggage is lost (I'd never put my data in a checked bag - always carry on - but still) - that entire trips worth of data could be lost. So one big advantage to the cloud there. This may be exhausting for you to read, but it is by no means an exhaustive resource of data storage solutions. Before you invest in a backup solution for your precious data, take the time to consider it all very carefully. I hope this helped and good luck! May your data never be corrupted!